The raw foods movement is making headlines. Why? Reasons include awareness about the environmental impacts of our food choices, interest in going organic and the desire to eat lower on the food chain. And across North America, people are viewing their expanding waistlines with horror. 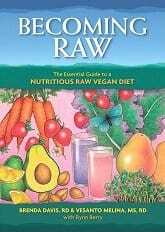 Centring one’s diet on raw plant foods offers a mighty appealing solution. Why is this a solution? One reason is that some of us consumers have trouble being moderate. For example, if there’s a bottle of wine or a case of beer handy, we’ll chug-a-lug or sip our way through the whole thing. To save ourselves, we join AA, where there’s a clear line. No alcohol at all. Period. Similarly, if we have cigarettes around, we can’t resist smoking. Our only way out is to quit, with no cigarettes in the house. When it comes to food, we can’t stop ourselves from eating the whole loaf of fresh bread, chocolate cake, bucket of chicken or bag of chips. Yet, if we want to quit, how do we manage? We can’t enrol our higher power in helping us to abstain entirely from food. We must eat something! Raw food to the rescue. It allows us to draw a clear line. Bread, butter, cake, fried chicken and chips all are on the other side of the line, where we don’t go. Yet we have plenty to eat. At first glance, this looks far too radical. But doesn’t giving up alcohol seem radical to a boozer? It seems that the person’s entire social life will vanish and there will be no way to relax. But after taking the leap, new horizons open: one discovers non-drinking friends and finds excellent ways to reduce stress. With raw foods, what are our choices? We head for the market’s colourful produce section. We load our cart with every type of fruit and explore all the veggies that can be eaten uncooked. Then we veer over to the nuts and seeds department. I had the pleasure of taking courses at Cherie’s school in Fort Bragg, California, midway between San Francisco and the California-Oregon border (check out www.rawfoodchef.com). These courses changed my relationship with food. Novices and experts from Washington DC, Tokyo and from across America and Europe flock to this school. Some train as raw chefs. Others learn new ways of eating for disease prevention or weight loss. We are fortunate to have this master chef here. Also in Vancouver, on the evening of Wednesday November 12, two colleagues from Cherie’s school, Karin and Rick Dina, present an Introduction to Raw Food Nutrition. On the following weekend (November 15-16), they present the Science of Raw Food Nutrition – it has had rave reviews – in Langley. Raw doesn’t have to mean chilly. Here are a few tips that help raw enthusiasts through colder months. We can start our day with muesli or a crunchy buckwheat granola or cinnamon oatmeal, adding fruit and warm almond milk. 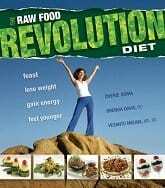 We might choose sprouted grain bread (See recipes in our new Raw Food Revolution Diet, also titled Raw Revolution Diet.) In smoothies and blended soups, we can use warm or hot water. We can wash or soak our produce in warm or hot water for a few minutes. We begin our meal with a cup of warm miso soup or ginger tea. We snack on almond butter with apples or bananas. And for some, it works best to combine a mainly raw diet with baked or steamed root vegetables or hearty bean and lentil soups.